The exhibit will include five pull-up panels interpreting Perkins’ legacy, as well as a video featuring work from prominent scholars. It targets middle and high school students. Perkins, the first woman to serve in a U.S. cabinet position, had deep roots in Maine. During her time as Franklin D. Roosevelt’s secretary of labor, she regularly returned to her family estate in Newcastle, the place she called home. Founded in 2008, the Frances Perkins Center preserves Perkins’ legacy by working with historians, biographers and other scholars to educate the public about her life and achievements. 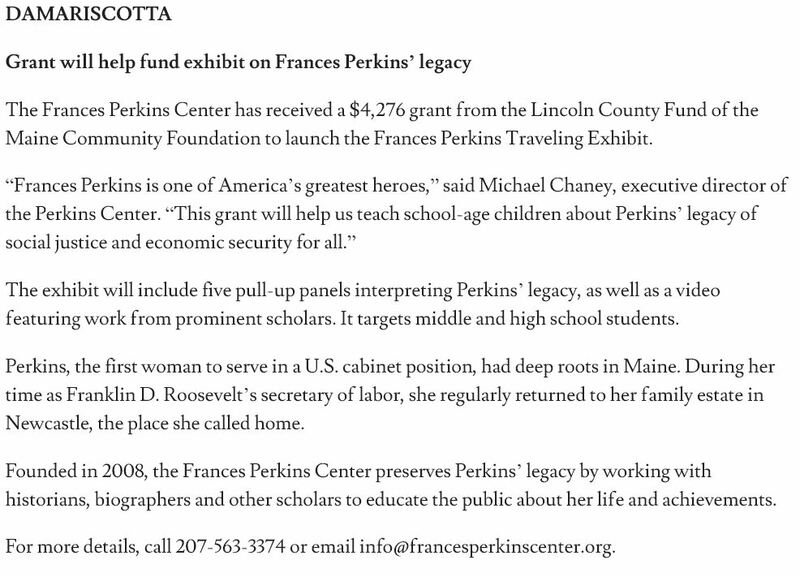 For more details, call 207-563-3374 or email info@francesperkinscenter.org.